Norrköping (/ˈnɔːrˌtʃɜːpɪŋ/, also US: /ˈnɔːrˌʃ-/, Swedish: [²nɔrːˌɕøːpɪŋ] ( listen)) is a city in the province of Östergötland in eastern Sweden and the seat of Norrköping Municipality, Östergötland County, about 160 km southwest of the national capital Stockholm. The city has a population of 95,618 inhabitants in 2016, out of a municipal total of 130,050, making it Sweden's tenth largest city and eighth largest municipality. The city is situated by the mouth of the river Motala ström, at Bråviken, an inlet of the Baltic Sea. Water power from the Motala ström and the good harbour were factors that facilitated the rapid growth of this once industrial city, known for its textile industry. It has several nicknames such as: "Sweden's Manchester", "Peking" and "Surbullestan" (Surbulle [sour bun] was a local nickname for the textile workers, and stan is short for Staden, which means The City or The Town in Swedish). The city has medieval foundations by settlers around the Norrköping twin city with Linköping Motala stream estuary, who used the falls and rapids to power their mills. The stream was also full of fish such as salmon. Exact dates are uncertain, but there are mentions of a church in the 12th century. It was dedicated to Saint Olaf, Norway's patron. The first trace of the city's name is from 1283, when Sophia of Denmark donated her rights of salmon fishing to the Skänninge monastery. The town is estimated to have received city status in the early 14th century, although no written documents exist prior to a document from 1384. This document, signed by Albrekt of Sweden is stored in the city archive today. Köping means there was a market there, while Nörr or Norr means "north". There is a smaller town nearby named Söderköping, or "South market". The city was the location of several battles in the ensuing centuries. As a consequence, nothing of the medieval Norrköping remains today. During the Northern Seven Years' War (1563–1570), the entire southern part of Norrköping was burnt. It was rebuilt by John III of Sweden, who designed the current street pattern. In 1618, a weapon industry was established by supervision of Gustavus Adolphus. The harbour also attracted ships due to its proximity to the industries of Finspång. In addition to the weapon industry, a large scale industry of textile was also initiated. An important benefactor was the industrial man Louis De Geer (1587–1652). At De Geer's death, Norrköping had 6,000 inhabitants and was Sweden's second largest city. The city again burnt in 1655, and again in 1719 during the Russian Pillage of 1719-21 when the Russians burnt it to the ground. Stones from the Johannisborg castle were used to build new houses, and today only a few stones remain. 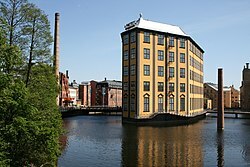 During the 18th century it was rebuilt and several industries soon got a stronghold: In the 1740s, Norrköping boasted three sugar refineries; in the 1750s the large scale influential snus industry was established. From this time stems the city churches of Saint Olof and Saint Hedvig, and several other old houses. In 1762, the first theater in Sweden outside of Stockholm was established in the city, the Egges Teater. Norrköping's importance again flourished. In 1769 the Swedish Riksdag assembled there. In 1800 King Gustav IV of Sweden was crowned in the Church of Saint Olof. In the later 18th and early 19th Centuries, Norrköping was one of the three Swedish cities where Jews were allowed to live (see History of the Jews in Sweden). The city again suffered fires in 1822 and 1826. Thereafter wooden houses were banned. In 1841 a ship industry was initiated as a branch of Motala Verkstad in Motala. In 1850 the industry had over 600 employees making it Sweden's largest ship industry at the time. During the remaining 19th century, the industries kept expanding. The area by the Motala Stream was developed further with the construction of a cotton refinery, and a paper mill was constructed in 1854, specializing in newspaper, and is still today exporting to customers around the world. The industry, including textile manufacturers, also expanded into the 20th century. In 1950 a total of 54 factories had 6,600 employees in town. By 1956, however, 18 of them had been closed due to competition from countries abroad with lower wages, such as Italy and Japan. In 1970 only 10 factories and 1,200 employees remained. In that year, the renowned Holmen paper mill, with its 350 years long history, announced closure, and another 900 people were let go. To counter the effects, several governmental authorities were relocated to Norrköping from Stockholm. See also Braviken Paper Mill. As of 2002, Norrköping is now seeing a revival, as a center of culture and education. The Norrköping symbol represents the "new" Norrköping. The Motala ström river flows through the city has a parade annexed. In connection to the latter is the industrial landscape where the old textile industries once were situated. In the summer, there is a cactus plantation in Carl Johans Park. 25,000 cacti planted there every summer. Kolmårdens Djurpark is a zoo located 30 km (19 mi) north of Norrköping. In connection to the large outdoor zoo, there is also Tropicariet, an aquarium, where for example snakes, crocodiles and sharks can be seen. The archipelagos 50 km (31 mi) away from Norrköping are called St Anna and Gryt. A campus of Linköping University, its own symphonic orchestra, an airport called Kungsängen with 170,000 traveling (2006), a high-tech industry park called Norrköping Science Park, and Petroglyphs from the Nordic Bronze Age. Norrköping had a humid continental climate for the reference period of 1961–1990, but it was borderline four-season oceanic during that period and has since more resembled the latter, with somewhat warmer temperatures year-round. In spite of it being located near the Baltic Sea, Norrköping has a relatively dry climate with precipitation levels averaging 508.2 millimetres (20.01 in) between 1961 and 1990. That would in turn be very low for a marine climate, but some way above more arid climates. The humidity for most of the year combined with there being no pronounced dry season keeps the surroundings green in spite of the rain shadow effect. Winter precipitation is quite low, but often falls as snow. On August 26, 2016, Norrköping set a nationwide record for the hottest temperature in the latter parts of August with 32.7 °C (90.9 °F) during a sudden and brief burst of extreme heat. The Swedish Transport Agency has its headquarters in Norrköping. as well as the main office of the Swedish Meteorological and Hydrological Institute (SMHI)  When the Civil Aviation Administration existed, its head office was in Norrköping. Norrköping is one of two Swedish cities (the other being Gothenburg) that retained its tram system after the 1967 conversion to right-hand drive, see Norrköping Tramway. A theatre in Norrköping, Egges Theatre, hosted the first Scandinavian performance of Shakespeare's Romeo and Juliet in 1776, and the city has a long theatre and revue tradition. Current main theatres are Östgötateatern (Sweden's biggest regional theatre) from 1947 and Arbisteatern from 1865. ^ a b "Localities 2010, area, population and density in localities 2005 and 2010 and change in area and population". Statistics Sweden. 29 May 2012. Archived from the original on 17 December 2012. ^ "Norrköping". The American Heritage Dictionary of the English Language (5th ed.). Boston: Houghton Mifflin Harcourt. 2014. Retrieved April 14, 2019. ^ "Norrköping" (US) and "Norrköping". Oxford Dictionaries. Oxford University Press. Retrieved April 14, 2019. ^ "Norrköping". Merriam-Webster Dictionary. Retrieved April 14, 2019. ^ "Population in localities increased by 120 000". Statistiska Centralbyrån. Archived from the original on 15 November 2017. Retrieved 15 November 2017. ^ "Industrilandskapet – Upplev Norrköping". Upplev.norrkoping.se. Archived from the original on 2009-04-28. Retrieved 2013-03-26. ^ "Parker & trädgårdar – Upplev Norrköping". Upplev.norrkoping.se. Archived from the original on 2009-04-27. Retrieved 2013-03-26. ^ "Start – Kolmården – Nordens största djurpark". Kolmarden.com. Retrieved 2013-03-26. ^ "Archipelago – Upplev Norrköping". Upplev.norrkoping.se. Archived from the original on 2013-04-18. Retrieved 2013-03-26. ^ "Climate Summary for Norrkoping, Sweden". Weatherbase. Retrieved 22 February 2015. ^ "Monthly Normal Precipitation 1961–1990 (Swedish)". SMHI. Retrieved 22 February 2015. ^ "Record late date for the annual highest temperature (almost)" (in Swedish). 29 August 2016. Retrieved 29 August 2016. ^ "Adresser till våra kontor Archived 2010-12-03 at the Wayback Machine," Swedish Transport Agency. Retrieved on 7 December 2010. "Huvudkontor Transportstyrelsen 601 73 Norrköping Besöksadress: Vikboplan 7, Norrköping Öppettider: Vardagar 08.00–16.30"
^ "Contact." Civil Aviation Administration. 16 June 2010. Retrieved on 6 December 2010. "Swedish Civil Aviation Administration S-601 79 Norrköping." Wikimedia Commons has media related to Norrköping.